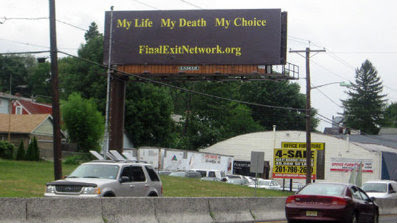 A national right-to-die organization has launched a controversial billboard campaign to inform terminally ill and elderly adults that they have a right to end their own lives — but critics say the group is simply preying on vulnerable senior citizens and mentally unstable people. But others say Final Exit’s mission is unethical ... and illegal. “The signs communicate a pro-suicide message that sends a dangerous message throughout society, including to people like the young who would not legally qualify for a lethal prescription,” said Wesley J. Smith, a California-based bioethicist who opposes assisted suicide. “I think they are trying to make themselves seem like an advocacy group rather than one in which some of its members engage in criminal suicide facilitation,” he said. Smith says the Voorhis case “shattered” the “pretense that the minions who participate in the Final Exit Network are mere counselors — rather than mobile assisted suicide clinics.”...Smith questions Final Exit’s judgment of “suffering” individuals and asks people to “take the time to look beneath the political posturing and the true agenda  death on demand for people with more than a transitory desire to die  comes clearly into focus.” “I think it is worth pointing out that the logic of these ideologues is impeccable. Once you accept the belief that killing is an acceptable answer to human suffering, assisting the suicides of the mentally ill — whose suffering is often far worse than those with physical illnesses — can become compelling,” he said. But Carolanne Cortese Barton of Alternate Group Counseling in Bayonne, N.J., says she sees the logic behind the billboard campaign, “because in life everyone has a choice, this really is all we have.” “Family traditions have changed and children are no longer able to take their elderly parents into their homes for care anymore and therefore have to send them to nursing homes,” Barton said. She said the billboards create awareness that there are options out there for people who are suffering and do not want their families to suffer further by paying for treatment and care. Wow. Honesty. How unusual in the drive to legalize assisted suicide. Whether she is right is the debate we should be having.